This CBD crystal isolate is more than 99% pure CBD and is Pharmaceutical Quality. The rest is just wax (C19 and C21), THC is non-detectable. 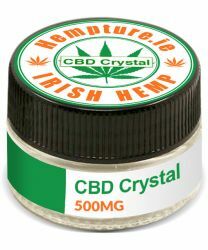 The hemp used in the production of this CBD crystal isolate is grown in Europe and is organic. Use 1-3 times daily. Place between 15-45mg approx under the tongue and hold for 60 seconds before swallowing. Pregnant women and lactating mothers should not use this product. Always consult a medical doctor before modifying your diet or using any new product. This product is not intended to diagnose, treat, cure, or prevent any disease. Hempture 99% Pure supercritical Co2 CBD Crystals is the highest quality CBD Crystal on the market. CBD Crystals can be dissolved under the tongue, used as an additive in foods, edibles etc. One of the easiest ways to use CBD crystals is in baked goods and foods. They can be dissolved into fatty foods like butter, coconut milk, and other cooking oils. Then, these fats can be used to make your favorite dessert or dish. This substance is non-hazardous, non-toxic and non-flammable according classification criteria of the EC directive 1272/2008 [EU-GHS/CLP].